A friend asked me the other day where to find good bread. Most stores where I live sell a tasteless, textureless, substance which they want to pass on as bread. Then it gets stale and hard the following day after you buy it. This would not do, so I decided to look for a good, and simple bread recipe. I had noticed something was wrong with the bread you buy in stores a few years ago. One day I needed to buy yeast to make a pizza dough recipe. Since I could not find it in the supermarket, I figured the next logical place to find yeast would be at the bakers. After visiting several stores, no one had yeast to sell me. I asked about how do they make the bread without yeast, and they told me they had ready mixes, and a special powders to rise the bread. That explained why the store bought bread had something wrong. There is nothing better than the smell of fresh bread aroma filling the kitchen. Here is a simple recipe, to make good homemade bread. It requires very little preparation time, although a long resting period. The most important tip for this recipe is to use high protein flour, or bread flour. That gives the bread a better taste, and a better crumb. The recipe will work also work with regular flour. Heat the water until it is barely warm. Add yeast to the warm water and wait for 5 minutes. Add the flour and salt to a large mixing bowl. Mix the salt and the water. Add the yeast and the water to the bowl. Mix. The flour should be almost pulling off from the bowl. If the flour is too watery add a little more flour. Form the dough into a ball. Flour a large tray or your working table. Knead the dough by pushing it with hard with the palm of one hand, then folding over itself. Knead the dough about 10 times. it should be a smooth ball by now. Clean the mixing bowl. Put the dough in the bowl, and cover with plastic wrap. Allow the dough to rise for two hours. After two hours the dough will have doubled in size. Flour the working area again, and knead the dough five times. Cut the dough into two pieces. Form each half into a cylindric roll. Punch down the dough and form into a roll again. The idea is to get the roll longer each time to about 1 foot long. Add cooking oil to a baking sheet. Place the two rolls separate from one another over the baking sheet. Cut 3 o 4 diagonal slices 1/2 inch into the bread. Let the rolls rise for 3 hours. The rolls will look like baguettes at this point. Preheat the oven to 425F. 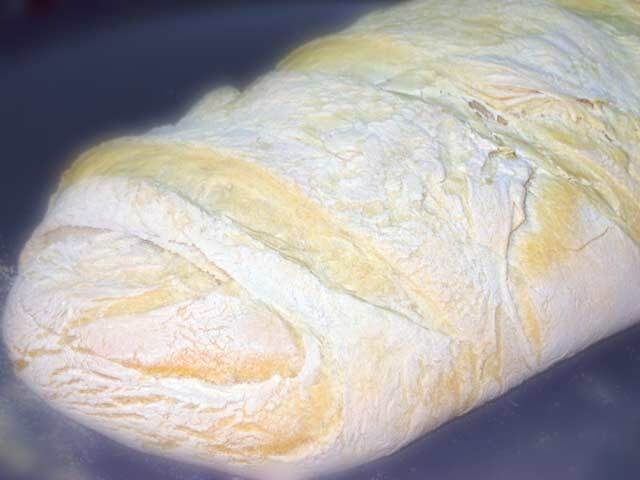 Bake the bread for 30 to 40 minutes, until the crust is golden brown. Leave the bread a few minutes to cool down.